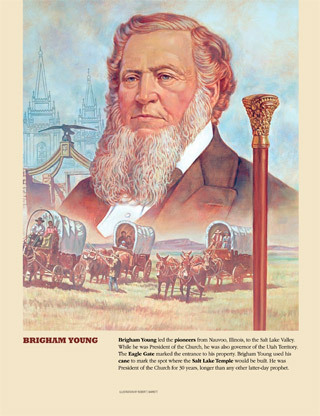 Brigham Young led the pioneers from Nauvoo, Illinois, to the Salt Lake Valley. While he was President of the Church, he also served as governor of the Utah Territory. The Eagle Gate marked the entrance to his property. Brigham Young used his cane to mark the spot where the Salt Lake Temple would be built. He was President of the Church for 30 years, longer than any other latter-day prophet.